Net thee some nettles, but do don gloves! Here's a fancy little something-from-nothing recipe. I spent the weekend moving so I didn't make it to any farmers markets, and I'm also working with a serious case of empty-fridge syndrome. But I've got the basics: eggs, cheeses, milk, butter and a few leftover bacon ends from Vermont Whey Fed Pigs, which I scored at the Winooski farmers market a few weeks ago. The nice part is that it's all local. The cheeses — Tarentaise from Spring Brook Farm, eggs from Savage Gardens, milk from Kimball Brook Farm... It's nice knowing all my staples come from nearby. And while I could have assembled a simple bacon, egg and cheese sandwich, I'm a huge advocate of greens for breakfast. And my new house is basically overgrowing with edible flora. I've been wanting to work with stinging nettles for a while now, and lacking other greens, today seemed like as good a day as any. 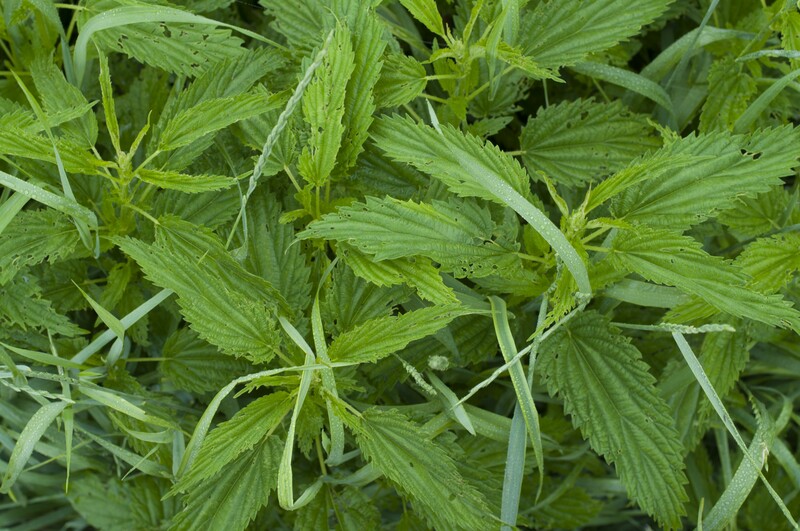 Nettles are a wonderful green, rich in fiber and said to help with all kinds of ailments. They taste like mild spinach, but with a hearty, toothsome texture. And while I wouldn't want to run into one bare-handed, they're easy enough to handle if you're properly protected. I used them to make a Vermont-y spin on Eggs Florentine. While it's quite a few steps to make, it's worth the effort! As you pick the nettle leaves and crowns from the stems, set a large pot of water on the stove to boil. Brown the bacon in a skillet, drain and reserve. Rinse the pan and toss a pat of butter into it — you'll need it later. When the water boils, heat the nettles. When the water returns to a boil, remove the nettles and plunge them in the ice water immediately. Leave them in the ice bath while you prepare the eggs and sauce. Using the same water you used for the nettles, boil the eggs for 4 minutes. Remove the eggs from the water but do not ice. Prepare the bechamel: Melt the butter in a shallow pan. Whisk in the flour and stir constantly until it turns a golden color. Add half of the milk, whisk until the sauce begins to thicken, then repeat with the rest of the milk, whisking steadily so it's nice and smooth. Add the cheese (and splashes of milk, if the sauce is too thick) and stir well. When the cheese melts, add salt and pepper to taste, Stir again, remove from heat and cover. Back to that skillet with the butter in it. Melt the butter over medium heat. Add the garlic and the iced nettles and salt to taste and sauté, stirring often, for 3-5 minutes, until the nettles are warmed and the garlic softens. Kill the heat and cover. Now it's time to assemble the dish! This is the fun part. Spoon half the sauce onto each plate, and make a nest of the warmed, garlicky nettles. Peel the eggs, and place one (or two!) in each nest. Sprinkle with bacon and grate more cheese over the top as garnish.